Lie to Me is one of the more direct songs Sara has written in her entire catalog. Ben Folds get co-writing credit here, was the producer on the track and provided the string orchestration. Upon first listen one might gather from it’s upbeat tempo and pop-like structure that this song is happy and destined to climb the charts of bubblegum pop. But to truly understand the song, it’s necessary to read the lyrics. This is not a happy song. In fact it’s rather dark, taken from the perspective of a person who has been burned one too many times by a certain someone, and now is fully expecting failure from them at every interaction. The song title is not “Lie to me because I want to be kept in the dark about the reality of our relationship”, but instead she knows it’s coming. It’s juxtaposed from the previous song on the record. In Stay she needed the lie so the night would never end. In Lie to Me she’s fed up with the person’s deception. She’s prepared, and doesn’t accept the behavior anymore. The first part of the chorus could really be a parenthetical addition to the song title (So I Can See You) Lie to Me. This song is very different in structure. It has more of a traditional pop radio feel. There’s heavy sustain on the vocals that is a signature point of style on the entire EP. There are gritty loops, lots of electronic additions, and melancholy strings that make this song quite unique. I would guess this was the last song written for the EP, because Lie to Me feels like it was the proof of concept for songs that found their way on to the next album The Blessed Unrest. The drums in particular seem like a stepping stone to Brave. In Lie to Me the drums are the lead instrument. Not the piano. Not the bass, not even the loops. I bet we all have a couple people in our lives that we’d love to breathe red when they start to fib. Watch out liars. Watch out Rollins Band, and Lance Armstrong. Look out Pinocchio. If Sara had her way you’d all be breathing red. Why not consider subscribing to the RSS feed and never miss a post? This song is very hard to find. It’s not on any studio album, and while it’s tied to the EP Once Upon Another Time, it’s not on the EP. 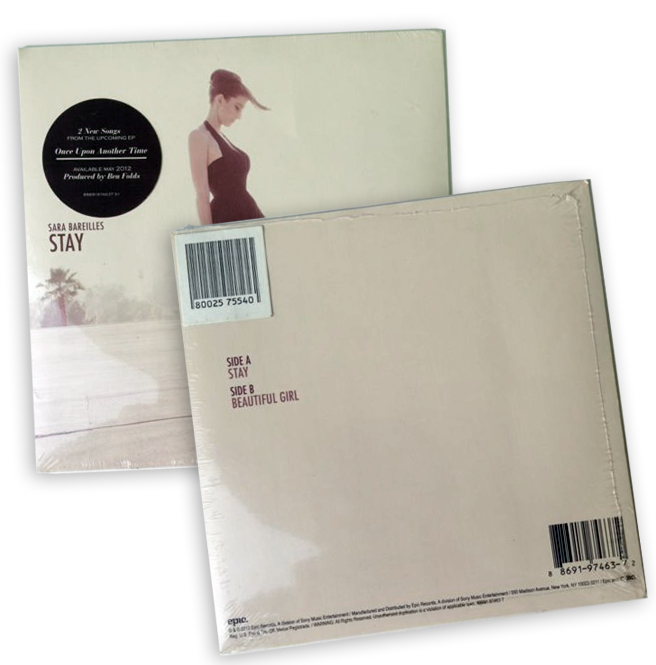 Beautiful Girl was only released as a 7″ vinyl only B-Side to Stay, the first single on the EP Once Upon Another Time, on Record Store Day in 2012. Beautiful Girl is one of the many songs written by Sara that are autobiographical. She has mentioned in concerts that she wrote this song as an adult to her younger 13 year old self. It’s a beautiful song with lyrics that will resonate with any young teenage girl or boy that battles with peer pressure, bullies at school, boys or girls with raging hormones and one’s struggle to fit in amidst puberty and the constant barrage of what’s deemed pretty by model clad magazine covers and celebrities in Hollywood. Beautiful Girl is also one of the many songs written by Sara that promotes finding strength within yourself and not allowing outside pressure to dictate how you should live your life. This is a song that every 13 year-old girl should listen too. I’ve never met Sara, nor do I ever expect to have the opportunity, but if I did I would thank her. I would thank her for her courage to share such a personal story for the benefit of others, and in this case for all the teenage girls that will listen to her song and be moved. My own daughter included. It seems that at the tipping point of her success Sara does not agree with abandoning all that she built in order to get that final push to achieve her success. Bottle It Up, sounds like a song pulled straight from the Tori Amos or Fiona Apple catalog (of which she is compared too), and I feel life the composition is intentional. The lyrics are also laced with a heavy dose of passive aggressive content that’s aimed to poke fun at her label. I get the sense that Sara knows exactly who she is and makes no apologies for sticking to her principles. Her journey from backyard nobody to household name was a long road paved with hard work, hours of touring and many sleepless nights. Just three songs into her sophomore effort, Bottle It Up is the second song on Little Voice with lyrics that detail how her label is trying to shape her into something she’s not comfortable with. Bottle It Up is about the tough music business and, more specifically, the struggles of being an artist with a recording contract. The verses are structured from the perspective of the record label executive talking to her about what she needs to do to her sound, style and music in order to make it big. She fights back in the chorus to say that she “Does it for love.” That takes balls. The irony here is that she wrote this before she had her record deal. I think it’s safe to say she’s wise beyond her years. There are two different versions of this song. The original album version starts immediately with Sara’s vocals whereas the single release (Which reached #15 on the US Billboard Adult Pop Songs) features a piano intro. I would guess it was by the request of the label, because a presell by a DJ would be tough to accomplish with a cold start and no musical lead-in. Top 40 Radio DJ’s need to talk over something to ruin the first six or seven seconds of a song out of the mic break, right? Why not consider subscribing via email and never miss a post? Sara’s an extraordinary lyricist. She doesn’t just write songs, she tells well-crafted miniature stories with profound lasting effect. Perfect example is the song Only Shadows. Currently not on any studio album, the song was broadcast live on September 10, 2012 over the Stageit.com online concert in order to raise money for the organization called Playing For Change. On this broadcast Sara states that she was inspired to write this song while on a jog in Brooklyn, NY. After her run she sat down at the piano that was inside her apartment and began to write. When I hear this song I get the sense it’s about someone who just can’t let go of a loved one who is about to move on from this world. Perhaps a parent, aunt or friend, child or spouse. In any case, I think Sara’s lyrics are pen to paper what most people are thinking when faced with the reality that they may only have hours, moments or breaths left with a loved one. In those last moments of their suffering or pain, she’s selfishly hoping for more time. She’s not ready to let go. Even though she knows it’s inevitable and certainly for the best. To let go, to know we are only shadows. Sara’s character understands this family member has suffered enough, but she’s not ready to say goodbye. She want’s more time before that loved one rises, and becomes “Only Shadows”, leaving her with the harsh reality that she must continue on without them. It’s a poetic and painful sentiment that all of us will have to identify with one day if we are fortunate enough to live a long a prosperous life. Sin city is all about the chase. The money, bright lights, and easy fame. It’s the chase of the slot machine, the get rich quick card game, the successful double-down, and for the musician it’s the chase of easy success. The premise is this: Just get me to Vegas, I’ll make it big, because that’s what people have told me. Sara crafts lyrics that are almost a warning to a younger self to be careful of what society has deemed important. The person Sara is talking to seems to have been a big fish in a small pond and is naive in chasing all the tempting cliche’s. Move to Vegas, or NYC and become a small fish in a big pond. Lose 10 pounds, and your identity too. Perhaps move to the Mexican border because someone told you that’s what’s necessary to gain success and be happy. But older Sara knows happiness is not something you chase. It’s a stable state of mind that comes from within. Success is just a result from years of sleepless nights, touring and hard work. Vegas has a groove that is reminiscent of the first half of Careful Confessions. The instruments are tight and her vocals and composition of the entire song plays like an upscale lounge song by someone performing in Vegas. My favorite part is at the end when she growls out the vocals “Vegas please.” A rare break in her usually crystal clear voice that I find very refreshing. This is Sara’s You’re So Vain. But in the Carly Simon’s version she was most likely talking about Mick Jagger, and most people thought it, leaving the inside joke, well, not so inside. Sara’s Love Song is a bit more discrete. Her song, while masked as a love song to a boy, is really a job of defiance against her label, Epic Records. They didn’t like the direction her album was taking and they wanted her to write a pop love song for the album. They also tried to mould her appearance, and ultimately her career into something that Sara was uncomfortable with. Sara stayed true to herself and her reward was her first Grammy nominations for Song of the Year and Best Female Pop Vocal Performance. Her first #1 hit on the Billboard Top 100. Her first #1 on iTunes, and the single is currently triple platinum. Well played Sara. Well played. So that said, the song really needs no other explanation. “ooooh”, and “aaaaahs” emit from the half circle and now the grandkids are hooked again and begin to lean in. Smiles from ear to ear. The youngest takes a sip of lemonade and squints, because the drink is a bit too tart. Sara has this unique ability to create new music that feels feel vintage and sophisticated. Sara’s sound has been described as everything from Norah Jones to Fiona Apple, and I’d even throw Ella Fitzgerald in the conversation. People like to make comparisons, because comparisons allow for an easy introduction for the unfamiliar. But while Sara is inspired my many, she is as individual as they come and has forged her own path with raw talent, hard work and years of determination. At the beginning of the song, Sara starts a capella and just shows off. The vocals are sick. Lyrics are sick. In summation this song is sick. Flat out angelic. A bit too much sustain overall, but that’s a theme for the entire EP and not just this song. The first section is retrospective of what she thought life was like during a time when she though she had it all figured out. She’s alone to experience life. No enemies yet, no porch light (read: address) or family to tie her down. She’s free in her solitude and her singular voice is the metaphor. In this moment she had it all, but Sara’s perspective in the story telling (Remember, Grandma Sara is telling this story to her grandkids) is of a wiser self who realizes this was a time of necessary naivety. It’s only until the strings, other voices and ambient sounds come into play where she transitions the story to a girl who starts to dream, and with that dream comes outside forces which would pull at her while she’s on her journey. The last song on Sara’s debut album is a live sweet and tender love song about a lover that she has yet to meet. Much like the song Come Around Soon, but the difference here is that she has yet to meet, whereas in Come Around Soon she is perhaps waiting for love to strike twice. the lyrics in My Love feel like a poem scratched on the pages of a diary with little editing. It’s structure is academic. Rigid. 4 lines per stanza, with rhymes and each end. The lyrics read like a stream of continuous thought. If not for Sara’s vocals, the structure of the lyrics would be obvious. in Undertow?,“ Between the Lines”, the new jukebox musical featuring the songs of Sara Bareilles!” Well if there was such a musical (And it would be epic) My Love would be the first song sung in Act I after we are introduced to our main character. She’d sing My Love after she hangs up her rotary phone in her bedroom fresh off a conversation with Mary her slightly older friend. Mary has a boyfriend, and while on the call confides with the heroine that despite the trouble, love can be pretty amazing. (Little do we know that Mary and her love will break-up later in Act I causing tension) After she hangs up the phone with Mary she imagines (campiness included) what a true love for her might be like. She pens her thoughts in her diary, and then gets called to set the table for dinner by her father in the kitchen off stage. Fade to black. Applause ensues. I always thought of the last song on an album to be akin to a season finale cliffhanger of that tv drama you just can’t quit. It leaves you wanting more from that artist. And Sara leaves her most poetic song on the album for the end. The next album can’t come fast enough. If you own a business you know there is one goal you should to focus on. Stay. Out. Of. The. Red. If not, your business fails. Retailers understand this goal. See there’s this silly day called Black Friday. It’s the day after Thanksgiving, and it’s called Black Friday because that’s the day where retailers, due in part to ridiculous price cuts and ravenous consumers, count on sales to move their ledger from the red to black. Now, I am not saying that Red is a song centered around saving businesses and commerce. Not at all. But Red is a song about saving. In this case Red is a song about Sara saving herself. The color red is an alert. A warning. But red is also the color of perceived happiness. Who doesn’t like a red firetruck, or want a red balloon as a kid? A red bike, or sports car? Red Starburst, jelly bean or Red Ryder BB Gun? Red, while a color of warning is also one of comfort, warmth and accomplishment. Sara explores this balance of the color red in the lyrics. She has devoted herself to life on the road she has to be mindful of warnings that can place her sanity in the red while chasing success. Things like the jerks, creeps and d-bags Sara talks references in City. Things like rejection and negativity that if dwelled on can bring her down. Or perhaps things like the separation from family and friends, lovers and companions that used to be there to lift her up when times became mentally bleak. At it’s core, Red is a message of strength and independence. Sara’s perspective tells us that in her isolation she’s developed coping measures to pull herself out of the red. So that she can enjoy the red things in life.